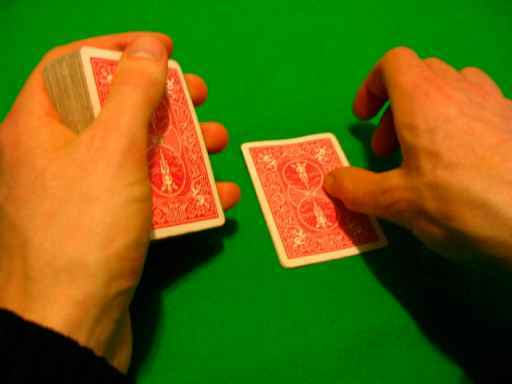 The double deal is an odd deal and one I use seldom, it's design is essentially intended to give a player a slight advantage by allowing him or her to play with a hand consisting of more cards than normal. 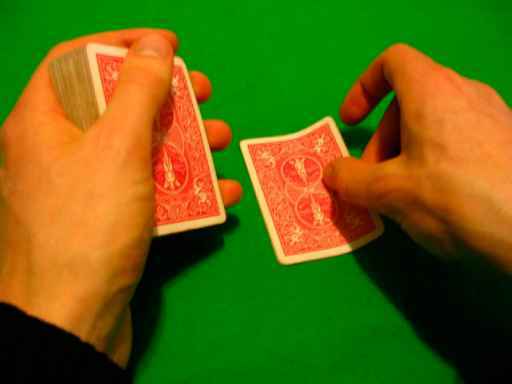 One accomplishes this feat by dealing two cards at once as though you are dealing only one card. 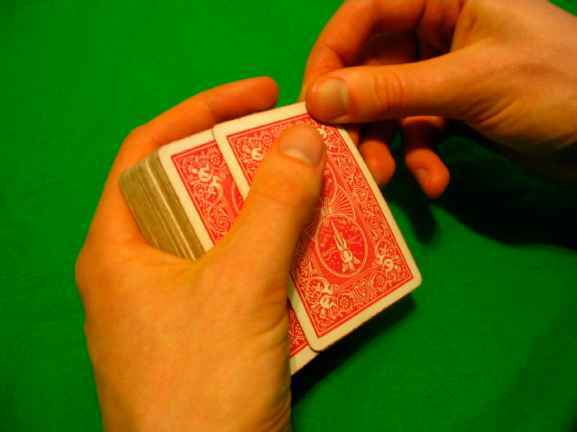 One can also employ the technique with reasonable success to the field of card magic. 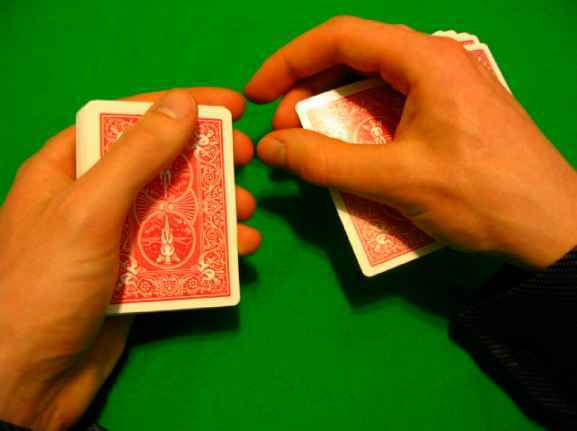 I will caution you from the beginning that the main problem with this deal lies in keeping the cards squarely together and thereby creating the illusion that only one card is present when there are actually two. Honestly, I find this is one of the more difficult deals for me to perform well for that very reason, though perhaps a much lower level of practice is also to blame. Whatever the case, generally, it is best not to double deal on the first deal, but rather to wait as late as possible, until a small pile of cards has accumulated in case the cards separate slightly, one will not likely notice that the number of cards is wrong. Naturally, one cannot always avoid a direct double deal, but it is generally desirable. You'll notice that I already laid the ground work for double dealing in the section on second dealing and so I will rely heavily on and consequently refer you often to the procedures outlined in the second deal section. Essentially, the two deals are exactly the same.. .except for the take. Normally, when performing a second deal one makes use of the thumb, forefinger and middle finger during the take. There is a disparity then between the take procedures I described earlier and this standard take. The reason for that lies in a plea for consistency. In other words, your take should be the same whether you are dealing seconds or doubles and so in my earlier descriptions I added the ring finger to the take as it is necessary (or at least desirable) during a double deal and one can apply it successfully to a second deal. I will point out then that for those who are not interested in double dealing (a category I frequently find myself a part of) you may revert to a three finger take for your second deals, which I believe you will find is somewhat more comfortable. All of these points having been made, my description then will focus around the take and action of dealing the double to the table. 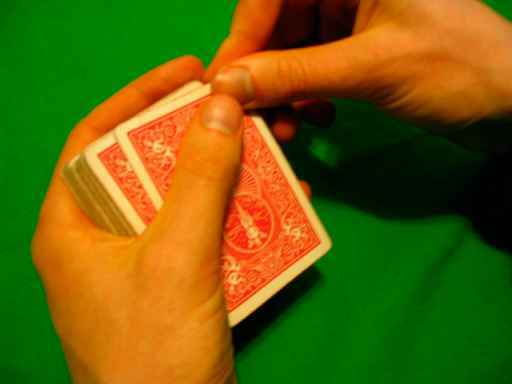 You begin as you would in any push-off second deal, (with the exception of push-off method one variation four and push-off method two variations three and four, which I will not cover or address) by pushing off two cards. (For those who have not familiarized themselves with earlier descriptions I recommend you refer to first to the push-off second deal descriptions. For those who are familiar with the push-off second deal handling, I invite you to follow along with your preferred method.) Now, I described the take earlier, but I will do so again giving particular attention to the squaring forces present, as keeping the cards square is in this case the primary concern. 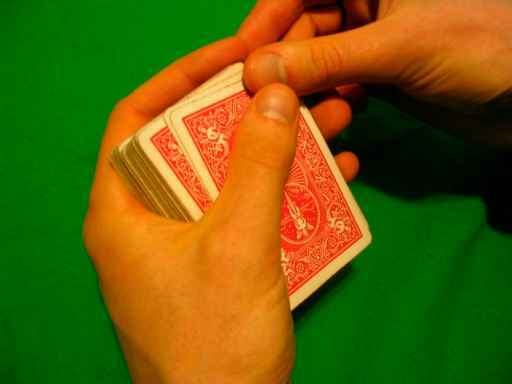 The right forefinger presses downward on the upper edge of the card, the middle finger takes the card from below, the thumb pinches down from the top and the ring finger applies a squaring force to the right edge of the card. From this point, you perform the take of both cards as you would one card. Naturally, you can't very well "sail" the card across the table so you'll have to restrict double dealing to positions within arm's reach. I have discovered that the lower right hand edge of the cards seems to be the weak spot where the two lose their alignment slightly. 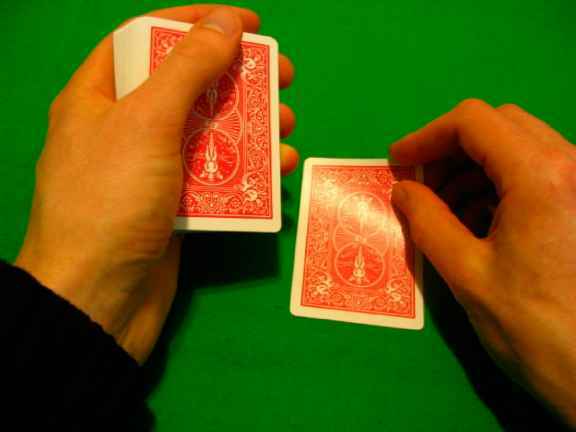 In order to avoid this, ensure the cards are square initially, ensure your right hand does nothing to skewer the alignment and finally ensure that as you take the card from the deck, the tips of your left hand fingers don't make contact with the card or it will move slightly. This technique works for essentially all the push-off second deals I described, it may take a little practice, but hopefully you will figure out the process fairly quickly. This is an odd technique that I debated not including. For quite some time I was under the belief that one could not perform a strike double deal and indeed this is not only an awkward deal, but somewhat of an odd one. Again, you may refer to the strike second deal techniques, though in the case of strike seconds I did not prepare you as well as with push-off seconds. 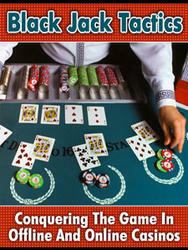 Virtually any handling will work, with the exception of method three and you could adapt it if you wanted to make use of the handling for double dealing. Again, the key lies in the take. 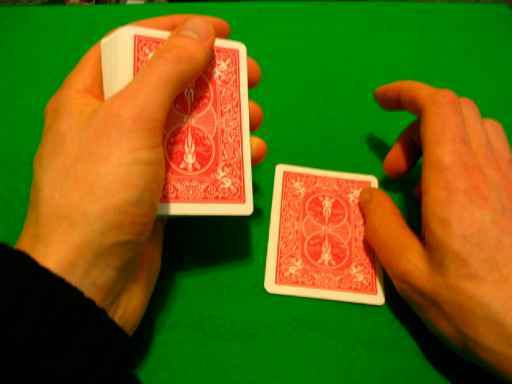 You'll notice that when performing a strike second there is generally a period of time when you could strike and catch not only the second card or the top card, but both cards and that is exactly what you will do here. Honestly, I haven't practiced the move extensively and so I'll outline concepts and ideas more than handling, perhaps at a later time I'll cover individual handling. My examples will flow from strike seconds method one variation one. Finally, your ring finger may provide the same assistance as in the push-off deal. 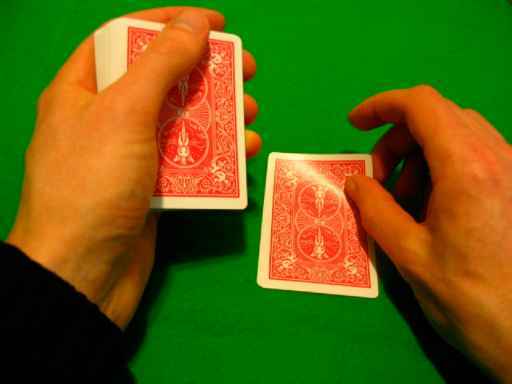 The dealing of the card to the table is also the same as in a push-off double deal. I apologize for the somewhat brief description, but with some measure of good fortune, this decidedly insufficient examination of the concept will endow you with a level of inspiration sufficient to improve on the method and deduce specific handling. That brief description then concludes the question of double dealing with two hands, quite a shock I know, that so little paper was invested but it should be kept in mind that I am not terribly fond of the double deal, though perhaps you are. If that is the case, I apologize for not offering greater assistance.